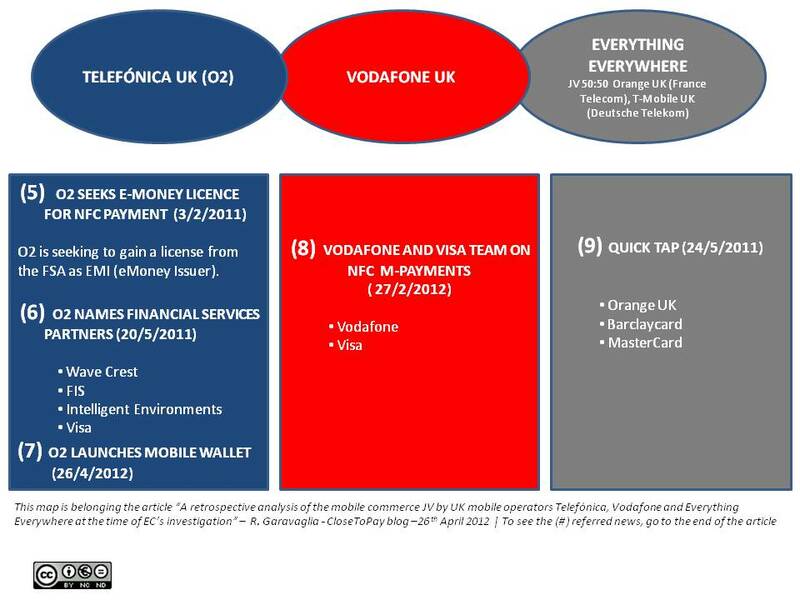 In the very last weeks, some news relating to EC’s investigation opened into mobile commerce JV by UK mobile operators Telefónica UK (O2), Vodafone and Everything Everywhere, urge me to give an in deep look at the matter, whit the aim to better understand what is the real scenario they are moving in (… or they was already moved in, even if by single initiatives, as I’ll try to argue in my article). The proposed joint venture, dubbed “Project Oscar” (first announced in June 2011), would create a company owned in equal parts by the above mentioned telcos, intended to create a single mobile wallet platform, where cards, coupons, transactionsal information, … are stored and managed, thank to the SIM card hosting. As reported by Dan Balaban’s article on 16th April 2012 (1), “[…] Besides setting specifications and business rules for NFC payment applications, Oscar would provide a “single contact point for advertisers, media agencies, retailers and brands,” the telcos said in a statement today, in which they noted that service providers would be able to “book advertising space and create campaigns across all opted-in mobile users, affording economies of scale that they could not ordinarily achieve.” “. By reading The Telegraph’s article on 12th April 2012 (4), I found that “[…] a source close to the process said that the European Commission’s Competition Directorate was likely to want to examine the proposals further largely because “the entire mobile phone payments market is still so embryonic”.” and – by continuing with Dan Balaban’article (1) – “[…] A fourth UK telco, Three, or Hutchison 3G UK, has opposed the proposed joint venture, and that may have influenced the decision of regulators to carry the antitrust investigation to a deeper level, though the commission’s statement Friday did not mention this“. During last fourteen months, each single operators have started (or declared the intention to start) different m-Payment projects, by involving bank or financial institutions in them. Hereafter I’d like to propose a map, to sum up the different initiatives. The platform powered by the JV, appears to be a Mobile Wallet platform, allowing financial institutions and other brands (transportation ?) to go to one place for payment and not-payment (e.g. loyalty/couponing/offers) services in the NFC scenario. The business model is based on a SIM rental proposition, as I’ve described in one of the oldest article of mine (10), on July 2009 “Mobile “estate” ” (only for Italian spoken guys, … sorry world! ), where the Secure Element is hosted in the SIM. The Secure Element backbones the Mobile Wallet and, inside of it, different Applications can be hosted (Payment Applications and Value-added Applications). Who can provide the Mobile Wallet? As far as regulation concerns, it should be useful and relevant to clarify some aspects regarding the Digital Wallet issuing activity. As remarked by the last White Paper on Mobile Payment (11), issued by EPC (European Payments Council) on 7th February 2012 , conceptually, a Mobile Wallet can be provided by an authorized Payment Services Provider (for instance, it could be an eMoney Issuer) that issues the payment means with the scope of managing only that specific payment means, or different payment means by the same PSP. “Alternatively, the mobile wallet can be provided by a Trusted Third Party but shall be conceived in to be able to manage payment means issued by multiple payment service providers.” states the EPC document. For the first case (PSP), I’m trying hereafter to analyze very shortly, some chances rising up the arrangement and evolution of the European regulatory framework for Payment Services, assessing the scenario of SEPA landscape, by focusing the opportunity for non-banking competitors (like telcos), to play the role o Payment Services Provider, under the prudential regime provisioned by the PSD (2007/64/EC Directive) and by the so called “2EMD” (Directive 2009/110/EC, on the taking up, pursuit and prudential supervision of the business of Electronic Money Institutions – EMI). In the SEPA paved arena, non-banking players can really get a Payment Institution or eMoney Issuer license, according to PSD and 2EMD, in one of the Member State; then, thank to the passporting right, they can deal with its payment services proposition, through the whole EEA (European Economic Area). Concerning the last chance (EMI), issuing e-money grants the new Payment Services Provider to issue and manage Stored Value Account (SVA) in a pre-paid way (is this the way O2 is seeking? the mobile operator has had an application for an e-money license lodged with the Financial Services Authority, for more than a year …). Although both the above opportunities can be endorsed by non-banking players via the creation of a hybrid entity (Hybrid Payment Institution o Hybrid EMI) and no NewCo should be needed, therefore they have to make an alliance with a bank, since PI/EMI cannot hold deposits (better: funds placed on Payment Account/SVA, require to PI and EMI to be compliant with the funds safeguarding rules, provisioned by PSD and 2EMD) and they cannot have the direct access to that Payment Systems listed in the SFD – Settlement Finality Directive. Finally, it’s correct to remark that PSD and 2EMD are not permitting everybody to become Payment Services Provider, as the way to get a valid Payment Services Provider clearance, is not so streamlined as it seems. In other terms, a new entrant, wishing to obtain a PI or EMI license, must own and demonstrate the best awareness about the complexity of the prudential regime and conduct of business rules, it will be compliant to (risk management/control, cost optimizing, protection of reputation, etc. ), and, of course, it must be able to manage it. A trusted brand/image along with the resources to manage customer relationships, are another basic ingredients, to achieve profitable goals in the Mobile Payment market, by dealing with a Payment Services proposition autonomously. As stated above, when I described the Mobile Wallet in the sense of “container“, I’ve left – deliberately – to understand, how it can bring not only the ability to host a sole generic “Mobile Payment Application,” but one (or more than one) “Value-Added Mobile Application”. The relevance of value-added services, such as Mobile couponing or geo-fenced promotions, is strategic for the development of the NFC market, as they are characterized by high profit margins that – in some circumstances – may partially subsidize the entire mobile eco-system. As the map I’ve drawn shows, each of the companies forming the JV, has already demonstrated their single commitment on the Mobile Payment Market, by revealing the ability to create partnership in what I can call “cooperative space” (TELCO – Finance). Can telcos in the JV, share their assets in the name of the “Open NFC”? What about future? Can the European Commission accept it needs a new approach to payment network JVs ? It is for posterity to judge! Proprio così (almeno stando alle notizie circolate nelle ultime due settimane). Ma iniziamo con il più lontano (rispetto a noi) segnale di apertura, quello che ci proviene dalla Corea del Sud e dal Giappone. Sembrerebbe che il primo operatore di rete mobile Sudcoreano SK Telecom insieme alle due importanti TELCOs Giapponesi KDD e Softbank Mobile (secondi solo a NTT DoCoMo), abbiano intenzione di pianificare una strategia di lungo termine, che mira a realizzare un terreno interoperabile, per servizi di pagamento e loyalty basati su tecnologia NFC. Terminati i lavori dell’Osservatorio NFC & Mobile Payment 2009 , il nuovo Osservatorio 2010 riparte ! campagne di Marketing ed erogazione di servizi su telefono cellulare attraverso tecnologie a corto raggio. Promuovere e sviluppare aree di test con i principali player di questo mercato, con finalità di dimostrazione/divulgazione verso il mercato. Su quest’ultimo punto, mi soffermo per richiamare l’attenzione del lettore su uno dei progetti pilota avviati nell’ambito dell’Osservatorio NFC & Mobile Payment 2009: EPICA Mobile. Il progetto, facendo leva sul fatto che alcuni importanti attori della filiera del pagamento, sottoscrittori della ricerca e presenti al tavolo di lavoro dell’Osservatorio, stanno operando attivamente su progetti di pagamento elettronico con tecnologie NFC (plastica e Mobile), si propone di raccogliere informazioni da tutti i progetti avviati dai sottoscrittori, costruendo una grande base di dati, su cui operare delle analisi statistiche volte a rispondere ad importanti domande di ricerca sul potenziale delle tecnologie NFC in ambito mobile Payment. Consolidamento e sviluppo dei progetti pilota. Tra le attività che personalmente ritengo più rilevanti, ai fini di una migliore definizione della strategia di sviluppo su Mobile Payment, il nuovo Oseervatorio NFC & Mobile Payment, prevede la realizzazione di survey sugli utenti che utilizzano i servizi di Mobile Payment e Contactless Payment, alla cui progettazione e definizione (stesura del questionario, determinazione delle aree di indagine empirica), i partecipanti sottoscrittori dell’Osservatorio possono attivamente contribuire. Anche nel corso del 2010, si terranno workshop di condivisione tra i sostenitori dell’Osservatorio, finalizzati a creare consenso e informazione sul progresso della Ricerca e, in linea con quanto già realizzato con successo nelle precedenti edizioni, verrà prodotto un Rapporto sintetico contenente i principali contenuti della Ricerca, che sarà presentato in un Convegno finale, cui potranno presenziare, in qualità di relatori, le aziende che avranno aderito ai lavori dell’Osservatorio. mandandomi una mail a: OsservatorioMP_at_closetopay.com. Ai prossimi lavori del nuovo Osservatorio 2010 !